Classical music lovers in Shekou are lucky to enjoy six concerts by acclaimed musicians right within their vicinity, as the Mountain View Theater in Sea World Cultural and Arts Center will unveil its classical music season in May. The six concerts feature aspiring and established pianists and violinists, all of whom will bring a variety of repertoire ranging from richly layered Baroque music, elegant Classical period music, and expressive Romantic music to free-style 20th-century music. Described by The Guardian as a performer of “fearless intensity,” British violinist Tamsin Waley-Cohen will present Beethoven’s beautiful “Spring Sonata,” Debussy’s “Violin Sonata in G Minor,” Elgar’s “Violin Sonata in E Minor, Op. 82” and a Heifetz-arranged tune from Gershwin’s opera “Porgy and Bess” on May 23. Having collaborated with Czech Philharmonic Orchestra, Royal Liverpool Philharmonic Orchestra, Royal Philharmonic and London Philharmonic, Waley-Cohen has established herself as one of the most insightful and versatile young violinists. 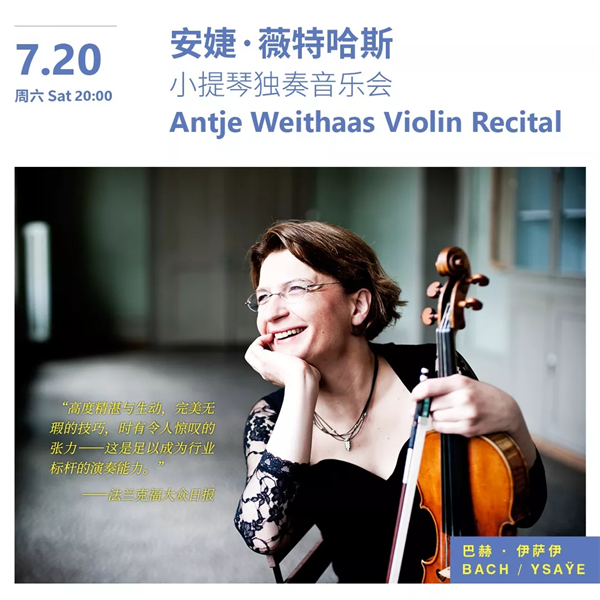 German violinist Antje Weithaas will show her compelling musical intelligence and technical mastery with pieces for solo violin. Bach’s “Partitas” No. 1 and 2, and Ysaÿe’s “Sonatas for Solo Violin” No. 2 and 5 will be played at a concert July 20. This program, with pieces echoing between the Baroque period and the 20th century, places high technical demands on its performer. And audience members will enjoy prominent characteristics and violin techniques from the two contrasting periods. Young Taiwanese violinist Tseng Yu-chien, a graduate from the Curtis Institute of Music and an International Tchaikovsky Competition winner, will present Tartini’s “Devil’s Trill Sonata,” Schumann’s “Violin Sonata No. 1, Op. 105,” Franck’s “Sonata in A Major for Violin and Piano,” as well as Ernst’s famously difficult piece “The Last Rose of Summer,” on Aug. 7. For the three piano concerts, there are mostly Classical, Romantic and 20th-century pieces. Russian pianist Irina Mejoueva will play familiar pieces by Chopin, Liszt, Debussy, as well as tunes by Russian composers Medtner and Scriabin, on June 23. French pianist and Leeds International Piano Competition winner Michel Dalberto will also present classic pieces by Chopin, Beethoven, Debussy, Mozart and Schumann on Nov. 12. The Van Cliburn International Piano Competition and the International Tchaikovsky Competition winner Barry Douglas’ debut album was a recording of Mussorgsky’s “Pictures at an Exhibition,” which will be rendered by the veteran musician at a concert Oct. 13. Audience members will also listen to him play Tchaikovsky’s popular “The Seasons,” a set of 12 beautiful short pieces for solo piano. In addition to the Western classical music concerts, international children’s plays “The Very Hungry Caterpillar Show” (June 12-16), “Hotel Crab” (July 6-7) and “Shh! We Have a Plan” (Dec. 12-15) and two French acrobatic shows (April 28, May 12) are also scheduled for the Mountain View Theater. Last year, three traditional Chinese instrument masters showed the tonal and visual charms of Oriental music in the theater’s “Beauty in Asian Instruments” concerts, attracting both Chinese and foreign music lovers in the city. And this year, the program will be staged again with more talented Chinese musicians. “The 328-seat Mountain View Theater, designed by Japanese architect Fumihiko Maki, is ideal for playing chamber music. Sitting in the theater, audience members are very close to the stage, so the 328 seats are all ‘the best seats of a grand concert hall,’” said Feng Biqi, who is in charge of performance program marketing at Sea World Cultural and Arts Center. She added that Western classical music, children’s plays, traditional Oriental music and avant-garde dramas will be the theater’s main programs. “Western classic music are the treasures of human civilization; Oriental music concerts blend traditional elements with innovative renditions; light-hearted but thought-provoking children’s plays are mostly presented by top international troupes; and avant-garde dramas explore possibilities and break rules,” she said.